From an idea by Regis in the comments in the last post. The original version of the ratchet model used a pair of friction loops to stop the tooth wheel rotating when it wasn't supposed to. Why not use a second pawl suggests Regis. It turned out to be a both simple and elegant solution. I cut away the friction loops with a sharp knife and removed them. 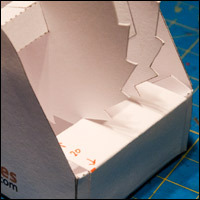 The second pawl was then just a simple fold of card glued to the box. It worked perfectly. I'll redo the full instructions with new parts shortly, meanwhile, if you want to give it a try, the extra parts are free to download at the end of this post. On the original model the friction loops helped keep the main wheel centred. To replace this function I've added a couple of washers. (Not shown in this picture.) The replacement axle just adds a couple of lines to show where the washer need to be lined up. Thanks Regis. Nice idea! 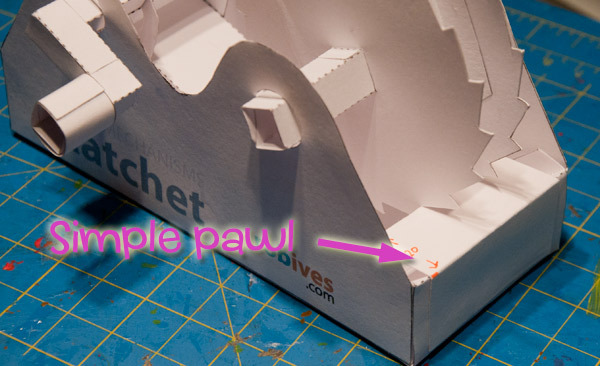 ← Ratchet models, all done bar the structural stuff.